Ben and his little hiker hui enjoyed a morning on the Judd Trail on Thursday while mom "babysat" the house during a carpet cleaning. 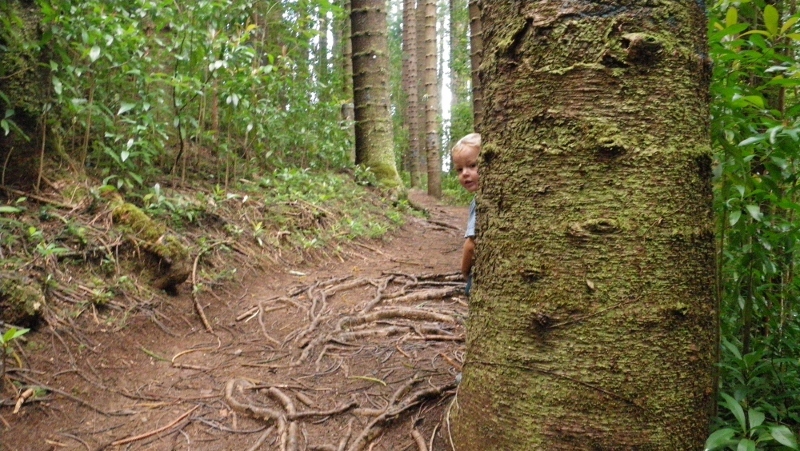 It was so nice to be out in the woods with the kids again. With a dengue fever outbreak a few weeks ago we'd decided to be prudent and stay out of damp windward woods for a bit. It was lovely to see the kids running free on the trail! This is what Sam thinks our WA house will be like - huge, with two levels. He's been working on this for months, adding to it gradually. We just got orders to move to WA which means things start moving here in the sell/pack arena. 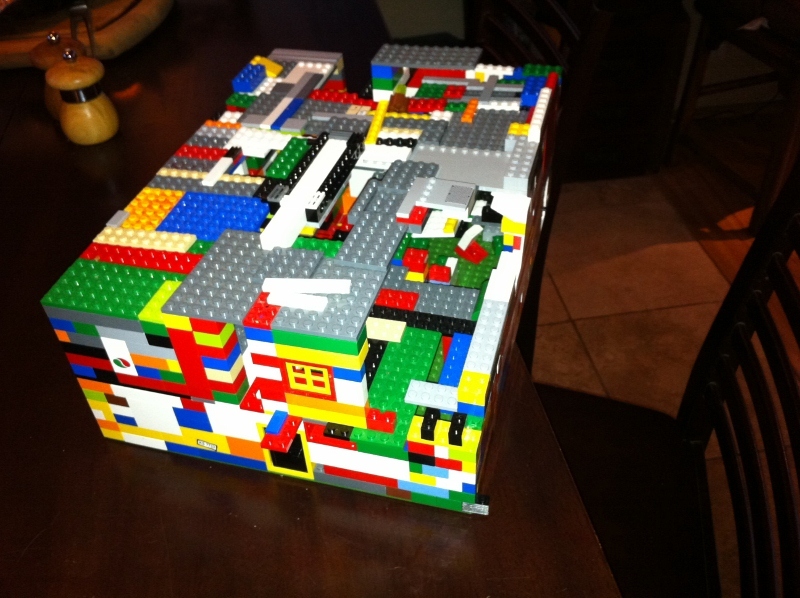 Click on the Lego house for April pictures, including some very funny videos. 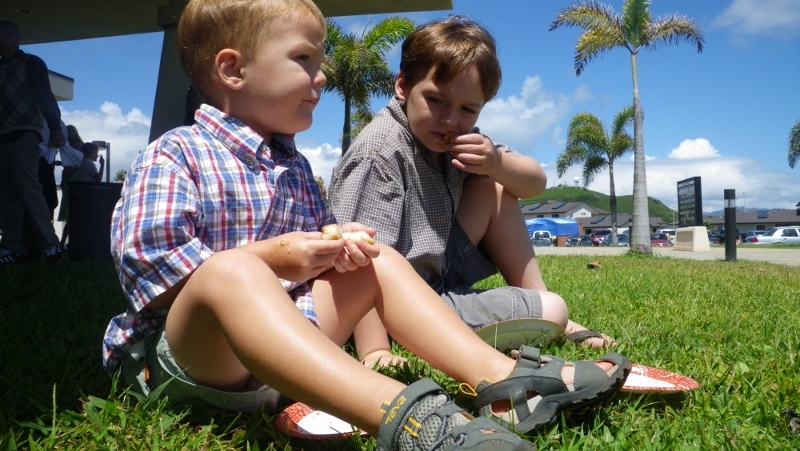 First Easter eggs for breakfast (the hard boiled kind that the boys LOVE), then Church, then donuts after church! Here they are contemplating the goodness of Church. Now the house smells of roasting roast, Yorkshire pudding is in the works, and I’m about to take a pre-feast nap! We are so lucky to have had a wonderful weekend together – we know we are blessed. Aloha to our ohana, both near and far! We love you! Oh – just remembered some things you might be interested in, Great Grandma…First the liturgy was right on target I thought, about the perils of practicing “cultural Catholicism” by not embracing the faith as one’s own. Then as everyone was leaving, we were finishing singing the last song before we left the pew. Ben was in the aisle, though, practicing genuflecting! I turned to see him watching everyone, then he’d face someone right behind us and go down on one knee just like she did, holding onto the pew for balance! It was so funny. Uncle Kevin always walks on the beach at the same time every day. I pass him around 0830 and we smile and comment on the sand condition which changes dramatically with the tides. Some days are gloriously easy, others more difficult! I thought I should finally start documenting some of the great people we know from our daily routines. We don’t always know their names (today I decided to ask these gentlemen) but nevertheless we know them and wave to them whenever our paths cross. I will miss them! Today we are doing a little informal Easter Egg Hunt in our backyard and getting together with some dear friends to talk story and play ukulele. It is warm here, and we’ve enjoyed a swim at the beach this morning followed by smoothies. Dave and I are looking forward to our next adventure in Washington but we will always be part Hawaiian. Dave will have lived here one quarter of his life by the time we leave. This place has taught us so much about how to care for the land, and for each other, because being on an island really affects one’s mentality. You feel more of a sense of community, like we’re all in this together. And for those who immerse themselves in the culture, seek knowledge from the kupuna, and open their hearts to experiences which might be unfamiliar, then the spirit of aloha and true love for the land and the place is inescapable. These islands and their people are a treasure. 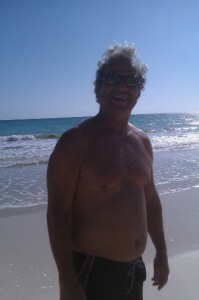 Uncle Steve is another beach buddy of ours - he has three kids and commented on how fast this time goes. I enjoy every jog along the beach with Ben. I will hold onto those memories and the smiles from the beach friends we pass every day. 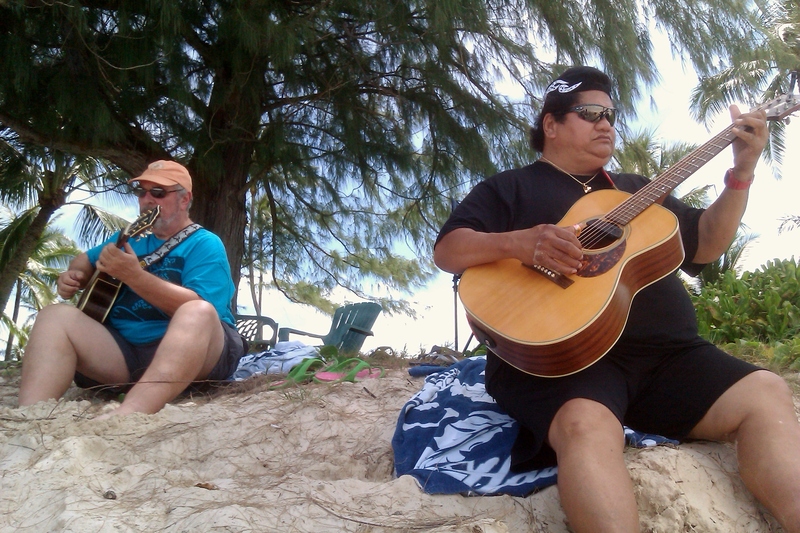 Ledward Kaapana and friend playing just for fun at Kailua Beach. Mom and I were hanging out on the beach with the boys while Dave was at work yesterday. I went for a jog and came back to find two guys playing beautiful music about 3 feet from us! Mom and I exchanged looks like “How in the world do we get this lucky?” When they took a break between songs I was like “Thank you! We LOVE Hawaiian music! So…are you famous?” Turns out he was indeed – Grammy Award-winning Ledward Ka’apana and his friend were the two guys gracing our afternoon. So despite increasing hunger and thirst, we were determined to stay as long as they did. Richard brought us some food and drinks and we enjoyed playing in the water with the duo’s incredible slack key and falsetto dancing around us. Led’s family is from the Big Island – the Kalapana area which is now nearly covered with lava – and he grew up around music. His family would hang out and have days-long bbqs where the whole family would break out instruments and just play. His sister sings with him now at Kona Brewing Company on Sundays I think. 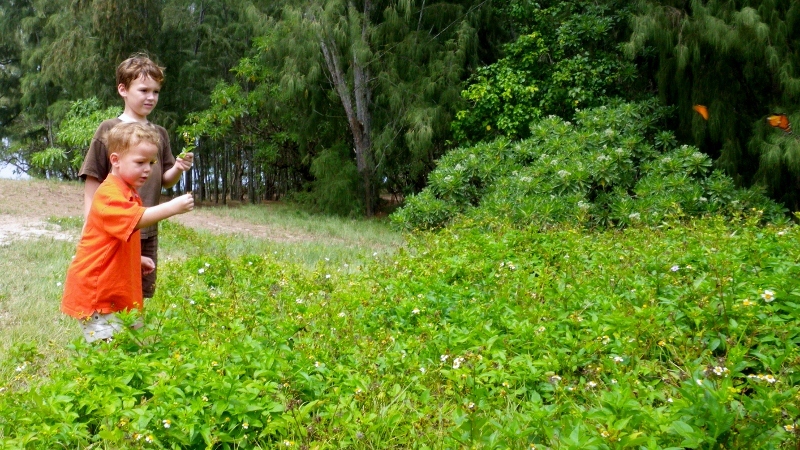 Click on the picture above for one of our favorite pieces – Wahine Ilikea, by Rev. Dennis Kamakahi. The whole story behind that song is amazing, too. 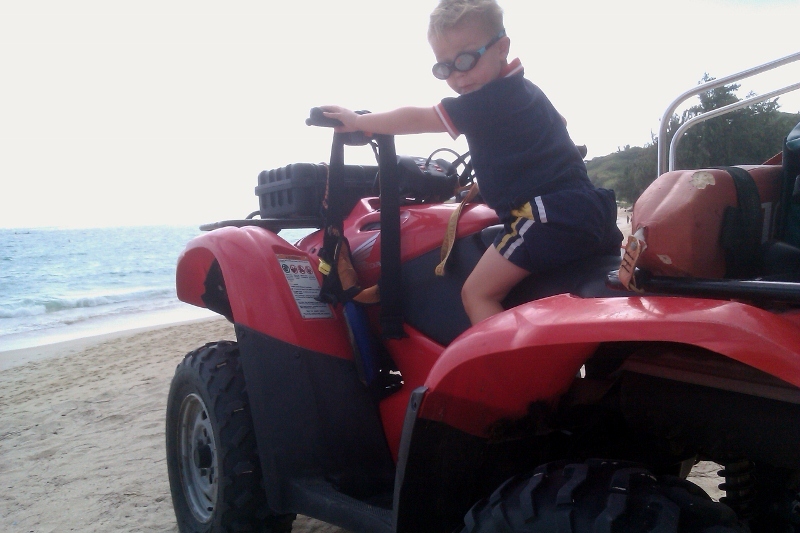 Ben got sit on an ATV on the beach! So I had kind-of a funny day today involving truck mechanics. Our clutch decided to go (the VW was repaired just a few months ago for the same thing) so we are not too excited about doing another clutch repair. Got an estimate from the dealer ($2100, 10 days to do it), then from another mechanic we pass on our route to school (a lot cheaper, after-market parts, but sounded like two weeks to do it). So I stopped in at our friendly VW mechanic just to confirm that after-market parts are ok to use (I have to report in to Dave on all my research) and turns out Barry says he can do it, on Tuesday, with OEM parts, for the same price. Wow. So I decide that is the way to go, and call the first mechanic who is a super nice guy with good recommendations (Rocky’s Auto). I apologize profusely, say it’s OEM parts vs after-market and can be done sooner. He explains he could do that as well and calls back with an estimate that is exactly the same as Barry! Oy! Didn’t mean to have two mechanics bidding on my one truck! Poor guys 🙁 But the part was already on order to Barry and so I am going to go drop something nice off at Rocky’s tomorrow on our way to school. I thought about maybe having them arm-wrestle for it…Honestly I never thought Barry could fix anything other than VWs. Not even sure the Xterra wants to hang out with a bunch of VWs while getting fixed. After a very busy afternoon editing a manuscript on deadline, creating graphics and graphs, conference call to troubleshoot some box and whisker plots, etc. the boys say they are hankering for dinner out at Zia’s. “We haven’t been there in SUCH a long time and we just LOVE the spaghetti and meatballs.” Dave is working late again so we are on our own (poor guy is working 15 hr days writing a 30 page report which he got behind on while away in Japan). So I ordered a Caesar salad with the fish of the day – opakapaka. It is an odd fish – kinda gamey, strong tasting, very fleshy/muscley. The boys were going “Something smells FISHY!” all during dinner thanks to their love of Madagascar (the movie). It didn’t taste like a fish, didn’t smell like a fish. In fact, it smelled more like a goat. Dave informed me tonight that I was thinking of alpaca. I am really confused today, huh? Is that a fish, or a mammal on my salad? Someone please tell me! 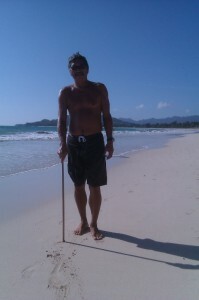 Dave got back yesterday from about a week in Guam followed by three weeks in Japan at the emergency op ctr in Yokosuka. 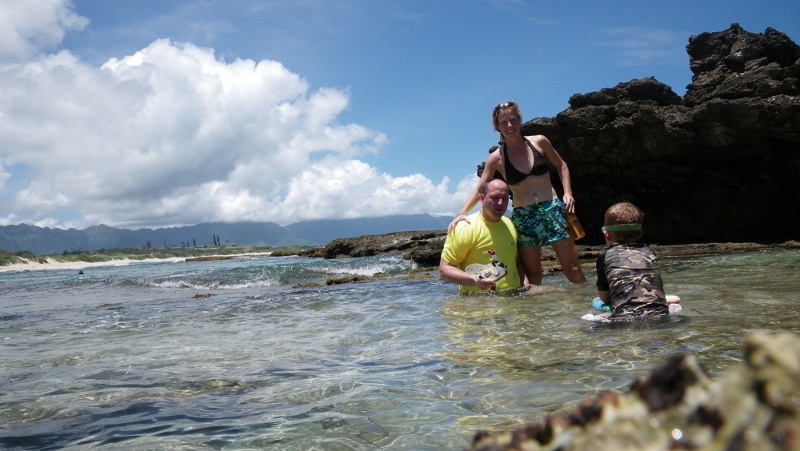 We had a lazy day going holo holo at the North Shore, including a hike at Turtle Bay on trails near the ocean. There was a little wildflower field which attracted a bunch of butterflies. The boys grabbed some flowers, hoping to attract a butterfly closer to them. There are two dancing off to the right in this picture - I didn't realize I'd caught a couple in the frame! So nice to have the whole family back together. Sam had Daddy throw a big sandstone rock at a tree to see it break apart. He picked up four pieces on the way back from the hike and carried them back to a stashing place near the restaurant. He also stashed his slippers under this particular bush. We had lunch and came back - the slippers were gone, but the four stones were there. They are now in his secret garden. The slippers were grubby, well worn, $7 slippers. They are only the second pair to ever go missing in 5 years living here. We figure someone needed them more than we did! March reading log (Kainalu Pride). Lest you think we are all nonsense, here’s a little picture of the monthly reading log, transformed into a calendar so it is actually useful to the whole family. The school asks us to record what we are reading daily, and also to make note of any family, fitness or healthy foods we’ve worked into the day. The idea is to raise awareness that it takes more than just the school or academics to help each child reach his or her potential. We all work better when our environment is in a healthy balance. Of course finding that balance is hard for some of us ;0 but hey at least we try! 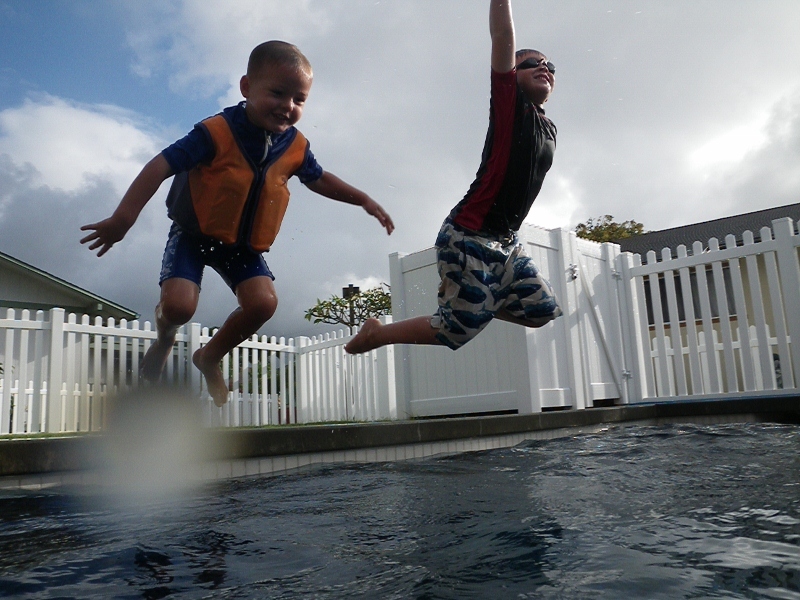 The boys are going a little nuts now – wonder if the neighbors can hear us???!!! 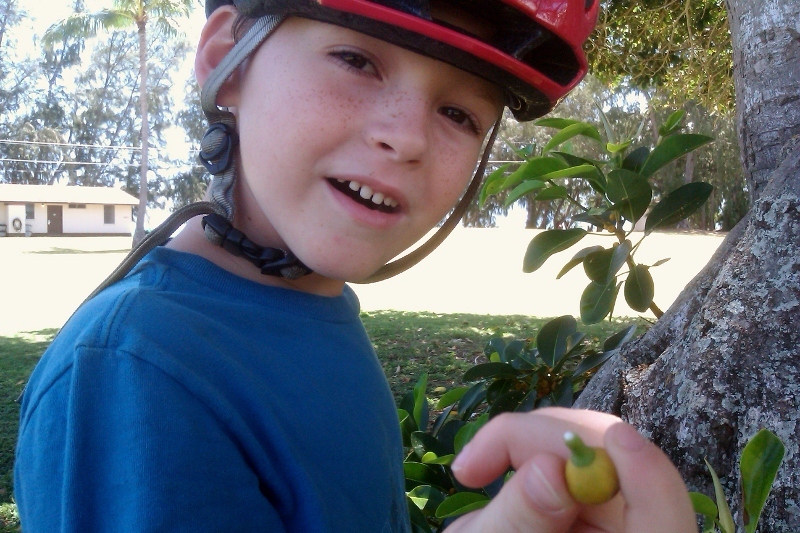 Sam spotted this fig tree on Bellows and identified it correctly. So we took a picture of it and measured how many Sams tall it was. Over 6 Sams! That's more than...24 feet! We had fun FIGurin' that one out! ha ha! So I have been cracking myself up lately with puns! I was on the phone with Dwayne at the Big Factory talking about how to replace my stroller wheel since I completely rusted out the bearings, nuts and skewer with beach jogs. It finally just wouldn’t work anymore. So we talked through options, including that I really need a quick-release so we can change tires on the fly if we get a blowout off-roading. When we were done arranging things, I said “Thanks for BEARing with me! Ha ha!” I liked this FIGuring one, too for the FIG tree. And using a Reese’s peanut butter cup was great for teaching fractions – I took a “tax” hit on Sam’s and told him that’s about how much the government takes from Daddy’s income. Then I took a small tax from Sam’s shortbread cookie (also round) and he guessed it was about 15%. Cookies are very good math aids I think. Anyway, after Taco Bell we headed home to gear up for the week ahead fixing tires and such. A family came through to look at the house as a comp for another one in the association (so I was quickly stashing my Scotch and bandaids and laundry!). As a matter of fact, one of the many reasons I will miss Hawaii is this. When a damsel is in distress, she can walk out her driveway and in a matter of seconds find a knight to help her. I found a strong man to get the rest of the new, tight tire on the stroller wheel when I couldn’t muscle it. It’s like camping here. People are all around. Usually that is a fine thing! Here’s hoping you all had a great weekend and have a good week ahead. Aloha! "Beware the Ides of March" - right? 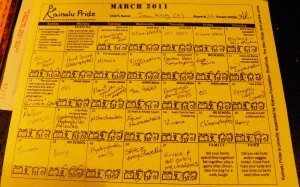 At weaker moments I think of March as a throw-away month, fraught with frustrations, setbacks, lost time. But in all trials there is wisdom to be learned and people who come forward to help (thanks Mom!). When I glance through all the pictures, we really have had a good month despite illness and Dave's travel. Enjoy the album by clicking on this photo. There are lots of videos, too. A hui hou!